LONDON 19.October 2013 - Professional photographer Nina Reistad of Nesodden,Norway was presented with the 8th Annual Black and White Spider Awards. Nominee in the category of Nature at a prestigious Nomination & Winners PhotoShow. The live online ceremony webcast Saturday, October 19, 2013 was attended by photography fans in 75 countries who logged on to see the climax of the industry's most important event for black and white photography. 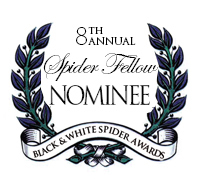 Lebon in Paris, to Fratelli Alinari in Florence who honored Spider Fellows with 246 coveted title awards and 938 nominees in 14 categories. Director. "Nina Reistad's "Cuerpo Al Natural," an exceptional image entered in the nature category, represents black and white photography at its finest, and we're pleased to present her with the title of Nominee." Awarded photos from Black & White Spider awards, NFF Landskonkurransen (Norges Fotografforbund / Norwegian photographers association) and Utsnitt (Norske Reklamefotografer / Norwegian advertizing photographers).